The hierarchy is based on the notion of subset. An example of structure is given below for SBGN Entity Relationships. 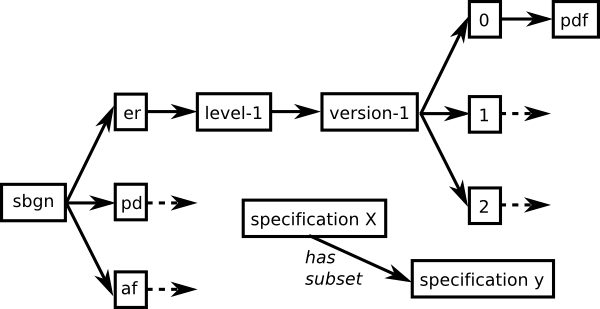 An ER specification is a subset of SBGN specifications. SBGN ER Level 1 Version 1.2 is a subset of SBGN ER Level 1 Version 1 specifications. And the PDF version of SBGN ER Level 1 Version 1.2 is a subset of SBGN ER Level 1 Version 1.2 specifications. Identifiers.org is then able to resolve those identifiers to pages on co.mbine.org. It is anticipated that the editors of each project will maintain their own pages. For the standards which do not have an editorial board (yet), the maintainer of the COMBINE site will take over. Here we will describe the procedure to handle an example standard, the super-hero description markup language (SHDML). SHDML has one level, one version and its specification is distributed as a PDF. We only want to describe the standard in a general way, and provide details of the latest specification. On the bottom left menu, click "Create content>>Page". Fill in the title (here "Super Hero Description Markup Language"). In "URL path settings", put "standards/shdml"
Fill in the title (here "SHDML Level 1 Version 1"). Fill in the content. It should contain a link to the specification itself. In "URL path settings", put "standards/shdml/level-1/version-1"
On the bottom left menu, click "Create content>>URL aliases Admin". Select the tab "add alias". In "Existing systems path", put the real page, such as "node/69"
In "Path alias", put the address you want to use as alias. For instance "node/69" must be aliased by "specifications/shdml", which therefore becomes alias of "standards/shdml". "node/70" must be aliased by "specifications/shdml.level-1.version-1", which therefore becomes alias of "standards/shdml/level-1/version-1". For the time being, we do not want to create a page for Level 1 of SHDML, and want to point to the last version instead. Therefore, we create another alias from "specifications/shdml.level-1" to "node/70". We can also create an alias from "node/70" to "standards/shdml/level-1" if we do not want the users to reach an empty page when looking for "http://co.mbine.org/standards/shdml/level-1". Finally, we want to access directly the PDF document with a standardised URL as well, so alias "system/files/shdml.level-1.version-1.pdf" to "specifications/shdml.level-1.version-1.pdf"
Note that aliases can be edited at any time. For instance, if a new intermediary page is created, to replace the automatic link to the latest specification. Although the infrastructure does not need a central list of all the specifications, it is handy for the users to have an overview of what we cover. Please edit the table at standards/specifications, with both the specification identifier and the corresponding webpage.